The DEP reviews and issues decisions on wind energy developments statewide. In 2003, the Maine Legislature created the Maine Wind Energy Act (Title35-A, §§3401-3459) to encourage the appropriate development of wind energy projects in Maine. 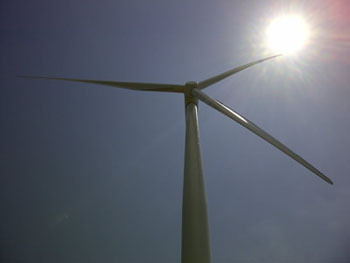 The Legislature also modified the permitting process for wind energy developments based on the unique nature of the projects. Grid-scale wind energy developments. The Maine Wind Energy Act (Title 35-A, §3451(6)) defines these developments as a wind energy development that triggers the thresholds for a Site Location of Development Act permit. Generally this means that a proposed wind energy project that creates more than 3 acres of impervious area (roads, turbine pads, etc.) would be considered a ‘grid-scale’ project. Note that the definition does not include the minimum or maximum numbers of turbines or megawatts of electricity generated. Small-scale wind energy developments. Small-scale developments are defined in the Natural Resources Protection Act (Title 38, §480-II(1)) as having more than 100 kilowatts of generating capacity, but that are not grid-scale wind energy developments. These types of developments typically have 3 to 5 turbines, but the projects create less than 3 acres of impervious area. Wind energy developments are some of the largest and most complicated projects that the DEP reviews. DEP strongly recommends applicants meet early in the project development process with DEP staff to review the specifics of the project in order to identify the permitting process, review standards to be met, possible review timelines, etc. Please note that pre-application and pre-submission meetings are required for grid-scale projects and, while not required, are strongly encouraged for small-scale projects. Grid-scale developments. Grid-scale developments are regulated under the Maine Wind Energy Act (Title 35-A, §§3401-3459) and the Site Location of Development Act (Title 38, §§481-489-E). Expedited Permitting Area. The Maine Legislature defined certain areas of the state as being more appropriate for grid-scale wind energy developments. These areas are called ‘expedited permitting areas’, and include all organized towns in Maine, and a number of unorganized and deorganized areas of the state. The list of unorganized and deorganized in the expedited permitting area can be found at the Land Use Planning Commission website. Inside the Expedited Permitting Area. If a grid-scale wind energy development is proposed inside the expedited permitting area, then the review standards of the Maine Wind Energy Act apply. Outside the Expedited Permitting Area. If a grid-scale wind energy development is proposed outside the expedited permitting area, then the review standards of the Site Location of Development Act apply, and the Maine Wind Energy Act does not apply. Located both in and out of the Expedited Permitting Area. In this case, it’s best to contact DEP staff for a pre-application meeting to determine which review standards would apply. Small-scale developments. These types of developments are regulated under the Natural Resources Protection Act (Title 38, §480-II), but not the Maine Wind Energy Act or the Site Location of Development Act. Generally, small-scale developments provide much of the same data as grid-scale developments, but there are some differences. The public is offered the opportunity to comment on both types of wind energy developments during the DEP’s application review process. One or more public meetings are typically held during the application review process to provide additional opportunities for the public to comment on the proposed application. The DEP is in the process of developing a new rule chapter related to wind energy developments. The rule, Chapter 382 – Wind Energy Act Standards, will apply to both types of wind energy developments. The new rule is anticipated to become effective in Spring 2018. Permit Application for Site Location of Development projects. This application form applies to grid-scale wind energy developments. Part II – Submissions of the application form specifies the application materials required, including Sections 26 through 30 that are specific to grid-scale wind energy developments. Application for Siting Certification and Natural Resource Protection Act Permit for Small-Scale Wind Energy Developments. This application form lists the application materials required for small-scale wind energy developments, and it provides the form for publishing public notice. For both types of wind energy development applications, the application fee and processing review time schedules can be found in the respective Fee and Processing schedules. ‘Maine’s Finest Lakes’ study. This is the October 1989 document prepared by the Maine State Planning Office that lists the 66 great ponds having outstanding or significant scenic quality. ‘Maine Wildlands Lake Assessment’ (PDF, 4.6 MB). This is the June 1987 document published by the Land Use Planning Commission that lists the 280 great ponds in the unorganized territories designated as outstanding or significant from a scenic perspective. ‘Maine Rivers Study’ (PDF, 9.5 MB). This is the May 1982 document published by the former Maine Department of Conservation identifying the rivers or streams that have unique or outstanding scenic attributes. ‘Designated Scenic Viewpoints on Public Reserved Land or Publicly Accessible Trails’ (MS Word). The former Maine Department of Conservation’s rule Chapter 3 that lists areas of state public reserved lands or on publicly accessible trails used exclusively for pedestrian use. Prior to 2012 legislation, the Land Use Planning Commission issued licenses for a number of wind energy developments in the unorganized areas of Maine. More information on those projects can be found on the LUPC website. To provide easy access for document review, the DEP has a list of the final decisions issued on a number of wind energy development projects across Maine.